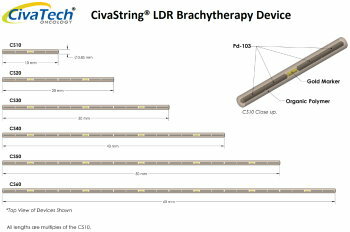 • M. J. Rivard, J. L. Reed, and L. A. DeWerd, “103Pd strings: Monte Carlo assessment of a new approach to brachytherapy source design,” Medical Physics 41, 011716 (2014). • J. L. Reed, M.J. Rivard, J.A. Micka, W. S. Culberson, and L. A. DeWerd, “Experimental and Monte Carlo dosimetric characterization of a 1 cm 103Pd brachytherapy source,” Brachytherapy 13 (2014) 657-667.